If you’re a beginner and you haven’t decided what violin to choose yet, read our article where we talk about how to select a violin for beginners. And if you would like to purchase a Cecilio violin, you can get more info here. Being members of the stringed family, both the violin and the viola are played using a bow. 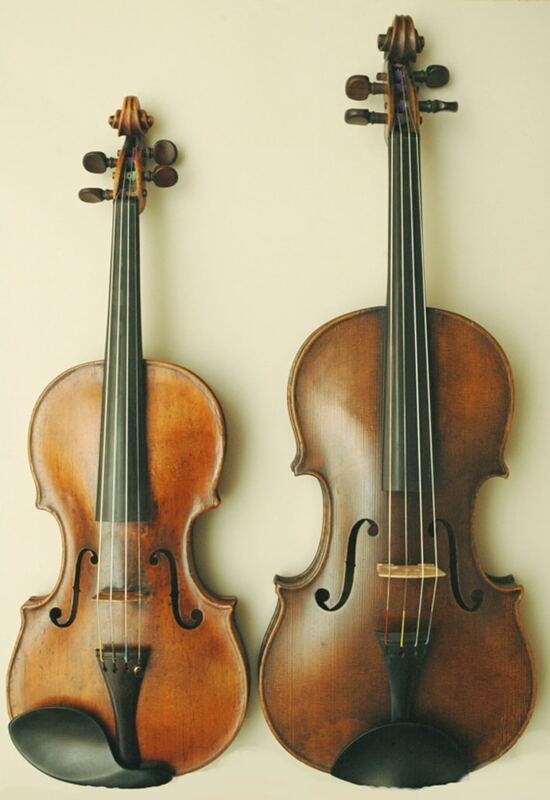 They are so similar because they descend from the viol family of instruments and they have the same ancestors. The “viola da gamba” (viol of the leg) was held between the legs and was the predecessor of the viola, while the “viola da braccio” (viol of the arm) was an evolution and the predecessor of the violin we know today. When placing a viola and a violin next to each other, you can see some things that make them different right from the start. First of all, the viola is a bit larger than the violin. The average length of a normal violin is about 14 inches, whilst the length of a viola is between 15 and 18 inches. Violas are also wider than their counterparts. One common thing that their body has is that it’s made of hardwood and both instruments are polished to perfection. They both come in different sizes, and while the violin sports 9 sizes, the viola only has 4 sizes to offer to those that want to play it. Beginners prefer using smaller violas that measure 12 inches in length. A full-size viola is harder to play, as it’s also difficult to hold. Because the viola was tasked to playing simple music in the 16th, 17th and 18th century, it used to be larger. Nowadays any viola larger than 15 inches is considered full-size, while a 4/4 violin is the equivalent of a 14-inch viola in terms of length. Both of these instruments have 4 strings, but the similarities stop there. Electric violins use 6 strings to be played. The tuning of these similar instruments is different. In the case of the violin, its strings are tuned as follows: G3, D4, A4, and E5. The viola is tuned to C3, G3, D4, and A4 and that means the violins are tuned one fifth above the viola. The lower range that the viola has means that people are more attracted by it because it allows them to play easier pieces of music. 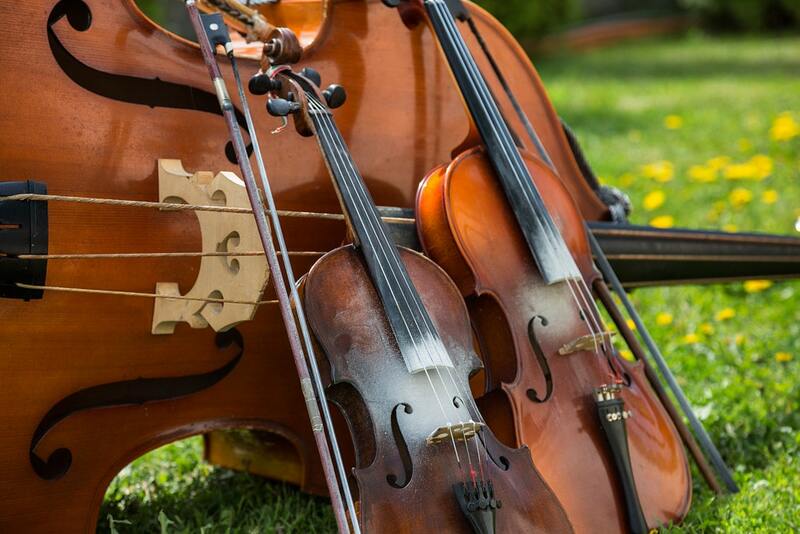 If you had the opportunity to compare stringed instruments, you probably noted that the bigger they are, the lower the frequency of the sound they produce. 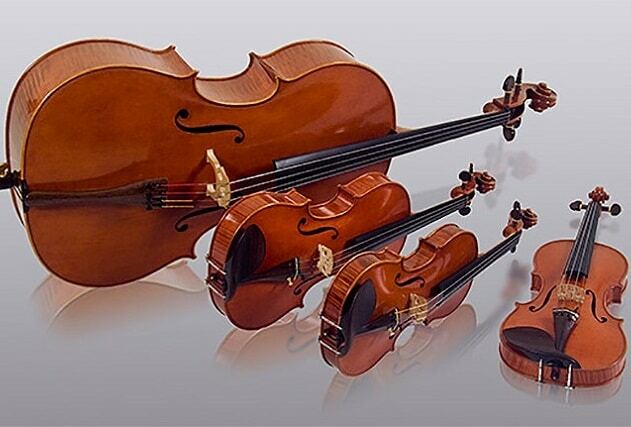 That is why the smallest and lightest instrument in its class, the violin produces the highest pitched sound, while the bass makes the lowest sounds and is the largest. In terms of size, the viola is slightly bigger than the violin and it follows this rule. The violin is the one responsible for covering the high parts of the piece of music and it usually gets all the melodies in the orchestra. On the other hand, the viola is the mid-range instrument, the one that should cover the “alto” parts, and by doing this it provides “the voices” in the ensemble, making everything sound fuller. Both of these instruments are important in an orchestra, but they serve different purposes. The melody of a piece of music is an essential part of it, but it wouldn’t sound so great without the backing voices and tonalities provided by all the other instruments. The viola offers harmonic richness and often gives context and meaning to what the violin is playing. Although the strings have the same configuration, the ones placed on the viola are one fifth lower. Both violin and viola have the G, D, and the A strings, and when the instruments have musical notes that can be played on both of them, they complete each other, creating a beautiful sound. In symphony arrangements, the violin is tasked with covering the high frequencies, taking advantage of the high range of this instrument. The viola, on the other hand, often utilizes the mellow sound of the low C string and resembles the human voice more. One more thing that makes the viola different from the violin is the clef it uses. Violin players use the very common treble clef, a usual aspect of upper range instruments. However, the viola, due to the low notes that it needs to produce, cannot use that clef. Instead, it uses something known as the viola clef or the alto clef. This clef got associated with the viola because it’s the only instrument that uses it in modern day music. There are certain sections in a piece of music where the viola needs to play in an upper register for an extended period of time, and for those parts, the composer writes the music in the treble clef. All the differences between these two instruments – their length, the thickness of their strings and the different range have an impact on the tone of each of them. That is why the violin can be heard as an instrument that produces light and airy tonalities, with a lot of high frequencies and little bass. This gives the impression of a rough, maybe crunchy sound, or a warm one when the strings are played for longer. Because the viola is bigger and its strings thicker, it creates a mellow sound. Also, due to its range and tone, the viola is one instrument that sounds close to the human voice, and that is a popular feature, even amongst those with an untrained ear. While nowadays there are very few musicians composing music for viola, particularly folk musicians and pop groups, there was a period when the viola was more popular. In the classical and baroque era, some music pieces were written for a solo viola. Violins are more popular today and they are used in classic compositions as well as mainstream music. That is because they are attractive for musicians of any kinds, as they are able to play melody lines, unlike any other instrument. It’s fair to say that the violin is the lead guitar of classical music, the one that draws the most attention.